My first attempt on 50 Hour Non Stop Run 2017 [43KM] (by maylindateo) | JustRunLah! 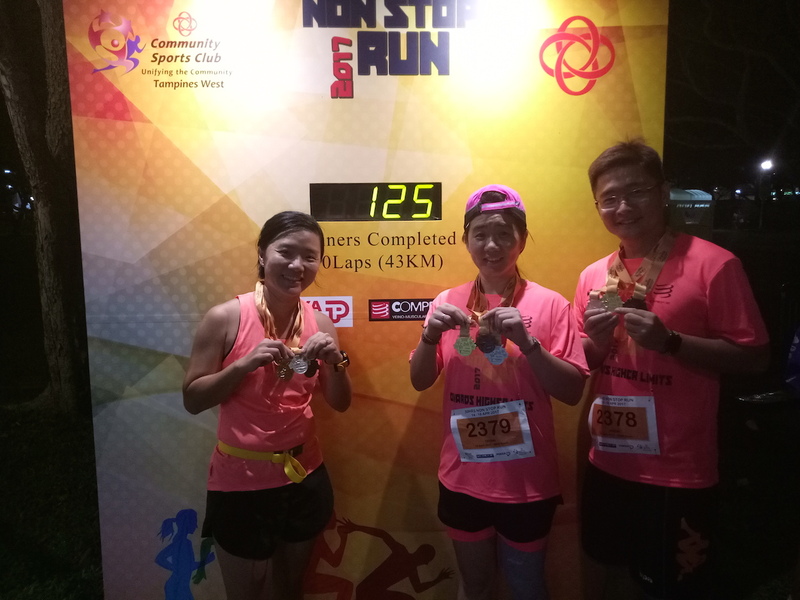 I took part in the 50 Hour Non Stop Run 2017 organised by Tampines West CSC. This was their 3rd year organising but my first time participating. 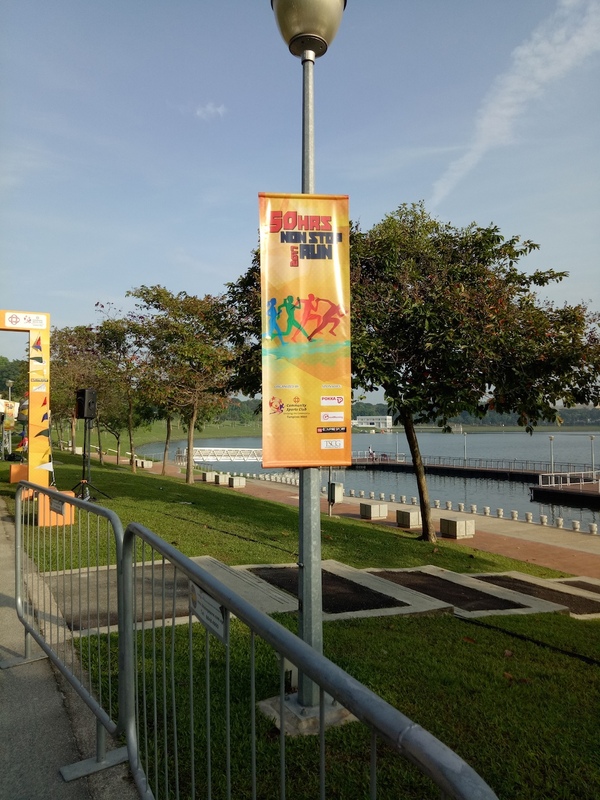 It was originated in 2015 as part of SG50 celebrations. Such an interesting event! 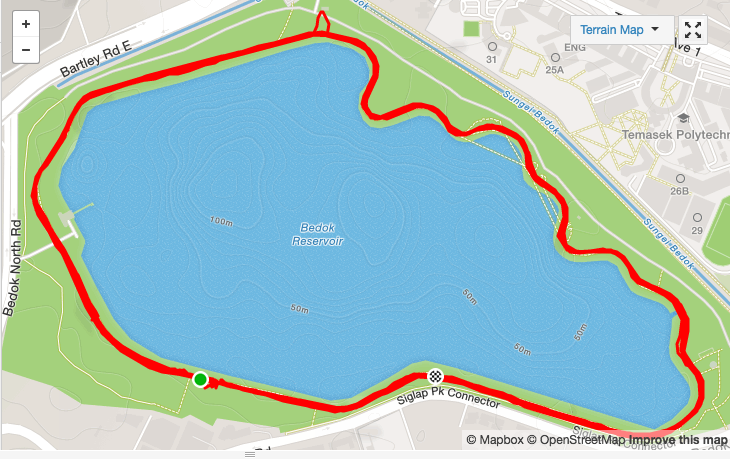 Runners are given 50 hours to complete 10 loops around Bedok Reservoir Park which is equivalent to 43KM (each loop is 4.3KM). 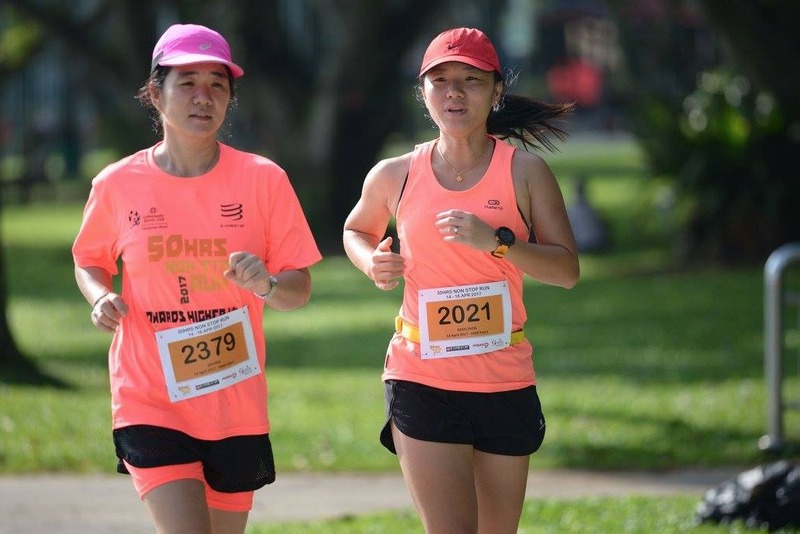 This year, they added a more challenging category of 15 loops (64.5KM)! Sounds crazy but there were many people who signed up for it and actually completed it within a day. We can choose to break it into 2 or 3 days within the event period (9.00AM on 14th April to 11.00AM on 16th April). It’s completely up to us. 43KM and 64.5KM are considered ultra marathon distances. But because there are 50 hours to complete it so the pressure is much reduced. Still, I did not have the courage to take up 15 loops and only signed up for 10 loops. Price was reasonable and affordable and we get a bright coloured running t-shirt. 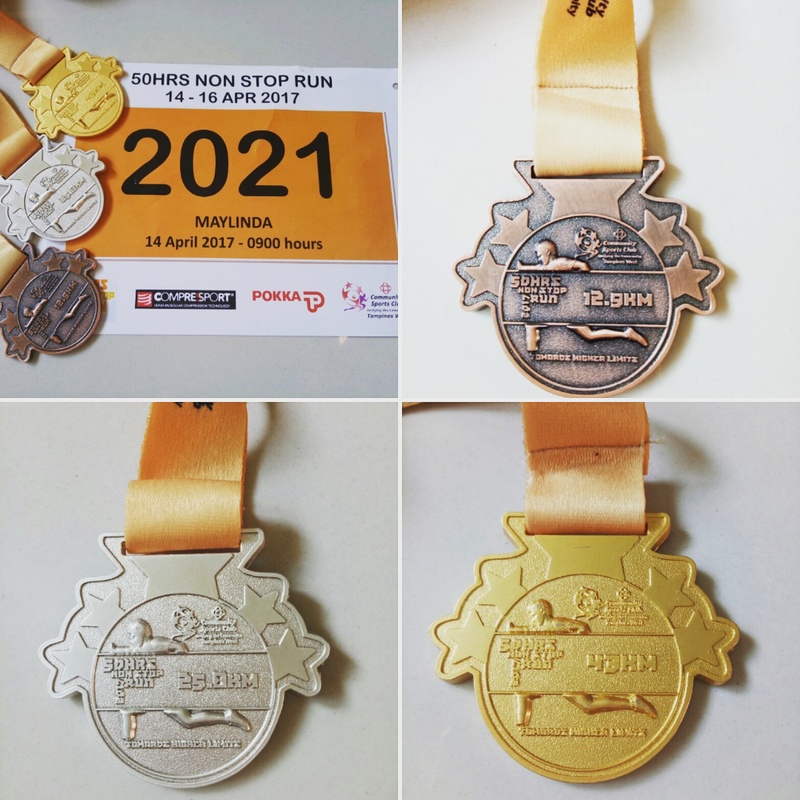 There were 3 medals runners could receive each after completing 3rd loop (12.9KM Bronze), 6th loop (25.8KM Silver) and 10th loop (43KM Gold). And of course, 15th loop (64.5KM) finishers will receive an extra medal (a different design) and a mystery gift which I just found out on event day that it was a finisher shirt! How nice. 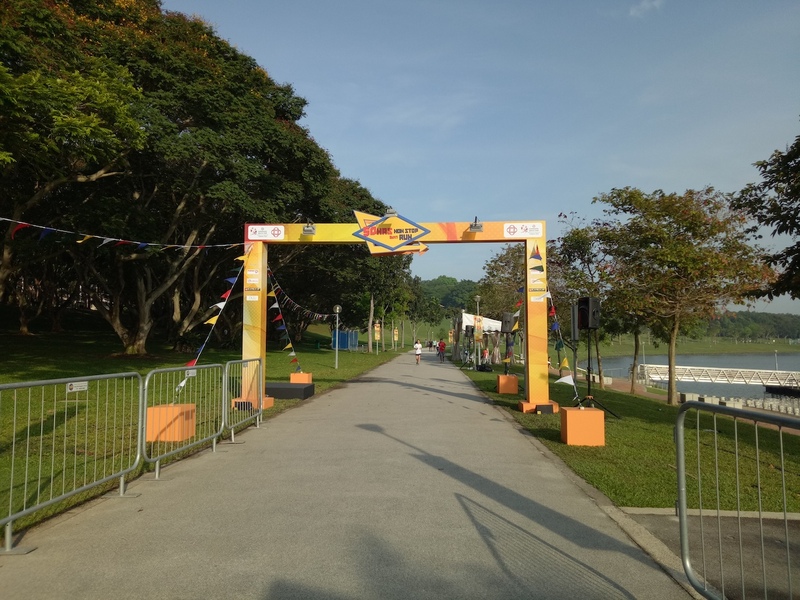 This event is a fun run event though the distances are ultra long as we can run at our own pace and time looping Bedok Reservoir. 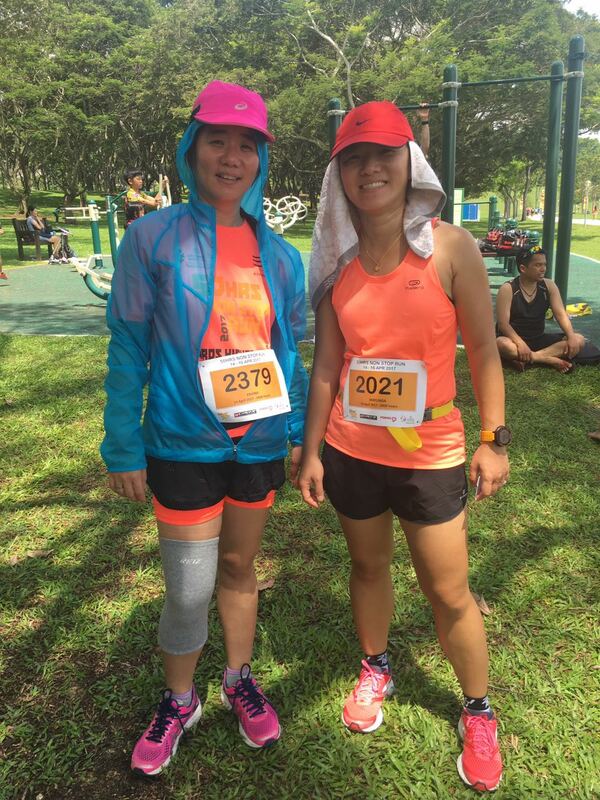 It was indeed a weekend well spent for many avid runners doing what they love. Sports drink and water were provided though they were not cold. Starting point was near the floating platform. Starting Point (A clockwise direction run). 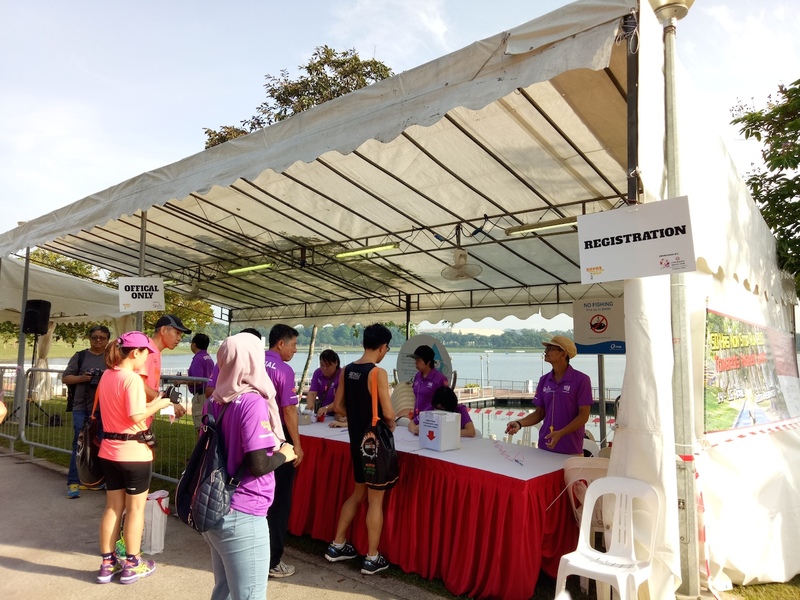 Registration counter and tent to report our attendance and drop the lucky draw card. Participants were given a race card each to record the number of loops completed. As it was a fun run, there was no timing chip given. We needed to carry the card with us the whole time we were running and get it stamped at the starting/ending point after completing every loop. This method could be quite a hassle because we need to be careful not to lose the card. My sister felt pressurised because she was afraid to lose the card. We needed to repeat the action of taking out the card from our waist pouch to get it stamped and put it back in over and over again. Another suggestion I could think of is to use a special type of wristband to let runners wear on the wrist after completing each loop. So at the end of 10 loops, they will have 10 wristbands on their wrists. Just like the ancient method of using rubber bands to record the number of laps run when there was no timing chip technology available yet. Organiser can consider that. 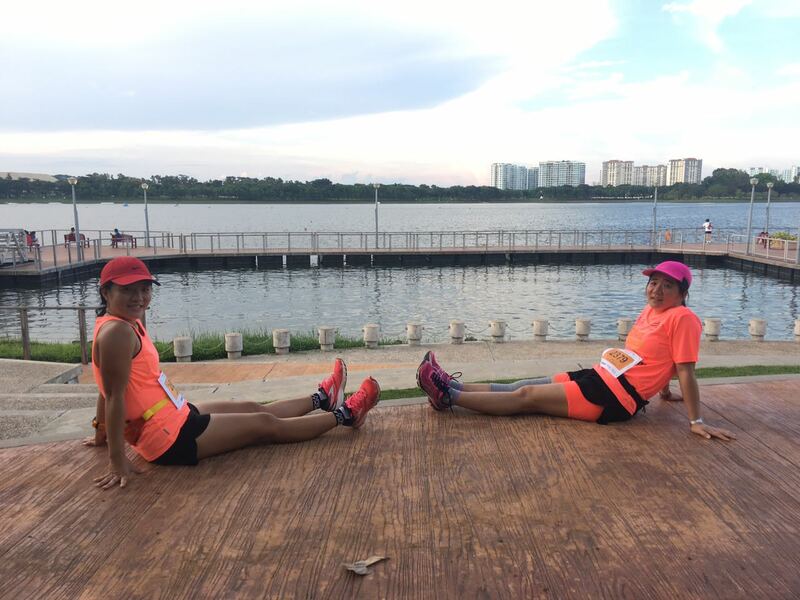 My running buddies a.k.a my siblings and I decided to finish the run within a day. We started at 9.00AM on the first day and the sun was burning hot! We ran and walked under the hot sun till 1.30PM before stopping for lunch break. While having lunch, it started to rain. Thanks to the rain, weather was much cooler after that and we could continue to run without having to wait till sunset. So we walked and ran loops after loops while enjoying the beautiful scenery. Also, applying Counter Pain cream on the legs because our legs were seriously screaming for help. On my 9th loop, my Garmin watch started to warn me of low battery. I was pretty worried if the watch would die and then my record would be all gone. I just charged it to full power the day before to get ready for this run. So I just ran non stop and refused to walk because I wanted to complete it quick so that I could save the distance clocked. 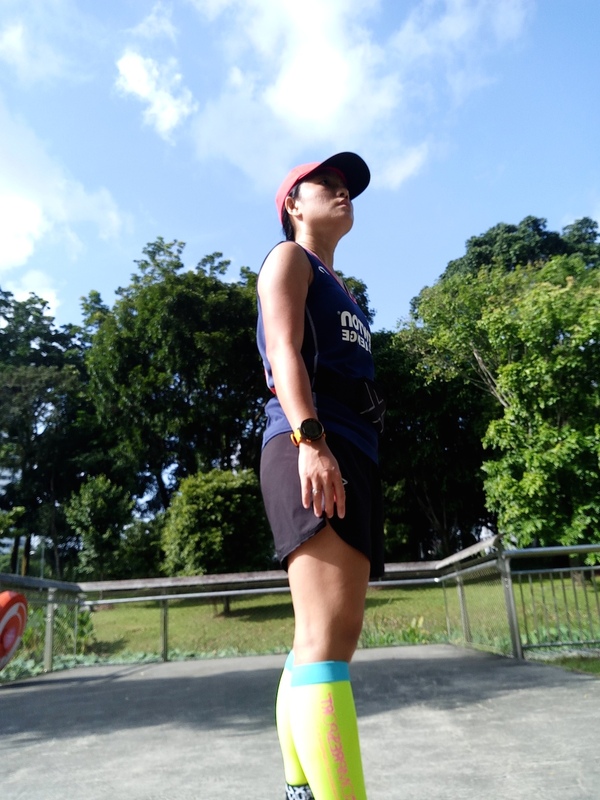 I received warning message again and again and when I reached the end of my 9th lap, I decided to continue my last and final lap without stopping for break. I carried on running my final lap and praying hard my watch would not die so soon. Finally the distance showed 43KM and I decided to just stop it and save, though there was still about another 200 meters to go. I walked this 200 meters to the end point. Seriously a mental and physical torture but I felt accomplished and enjoyed it! I collected all my 3 medals together and was asked to stand at the counter panel for a photo. I was the 112 runner to complete 10 laps. Happy and contented. I went to sit down and waited for my siblings to finish. Sky was so dark after we finally finished. Spent close to 12 hours at BR. Well done everyone! So I ran my first ever full marathon and beyond in a fun setting. It gave me the assurance and readiness to run my first classic full marathon by the end of the year. Keep running! A great and fun event for anyone to take part! Recommended.